Acknowledged author Marilyn J. Hockenberry PhD RN PNP-BC FAAN wrote Wong's Essentials of Pediatric Nursing, 10e comprising 1064 pages back in 2016. Textbook and etextbook are published under ISBN 0323353169 and 9780323353168. Since then Wong's Essentials of Pediatric Nursing, 10e textbook received total rating of 4 stars and was available to sell back to BooksRun online for the top buyback price of $30.33 or rent at the marketplace. Awarded first place in the 2017 AJN Book of the Year Awards in the Child Health category. 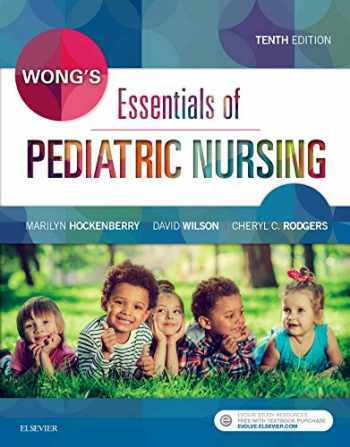 Known for its accuracy, evidence-based focus, and engaging writing style, Wong’s Essentials of Pediatric Nursing, 10th Edition has been the #1 title in the pediatric nursing market since it first published in 1980! Thoroughly revised to equip you with the latest research and guidelines for treating children today, it encourages a whole-body approach by beginning with child development and health promotion to better understand the later chapters on specific health problems. A new chapter featuring all systems cancers provides comprehensive information in one place. Nursing Care Plans now incorporate additional case studies to personalize interventions and promote critical thinking.A developmental approach clearly identifies key tasks, influences, and differences at each stage of a child’s growth to help students provide appropriate, individualized care for each child.UNIQUE! Critical thinking case studies allow you to test and develop your analytical skills in a variety of clinical situations.UNIQUE! Quality Patient Outcomes content in Nursing Care Management discussions for major diseases and disorders helps you understand how the care you provide directly impacts patient safety and promotes positive outcomes. Updated genetic content in the Developmental and Genetic Influences on Children chapter addresses rapidly changing and important information as it relates to children in health and illness.UNIQUE! Family focus includes a separate chapter on the role of the family in child health, family content throughout the text, and Family-Centered Care boxes that highlight information on patient teaching, home care, and incorporating the family in the child's care.UNIQUE! Translating Evidence into Practice boxes focus your attention on the application of research and critical thought processes to support and guide the outcomes of nursing care.UNIQUE! Atraumatic Care boxes guide you through performing procedures in a caring manner, promoting more positive experiences for children, families, and nurses. Drug Alerts throughout the text emphasize important drug information and point out potential safety issues.An emphasis on wellness offers health promotion and injury prevention strategies for each age group.Community Focus boxes provide resources and guidance on caring for children outside the clinical setting.Nursing Care Plans, including Nursing Diagnoses, Patient/Family Goals, Nursing Interventions/Rationales, and Expec1ted Outcomes, provide you with a model for planning patient care. Research Focus boxes help you remain abreast of current studies that impact pediatric nursing today.Cultural content, integrated throughout the text and highlighted in Cultural Considerations boxes, exposes you to customs and beliefs of different cultures that influence child care, enhancing your ability to provide quality nursing care to ALL children and their families.Nursing Tips throughout the text offer helpful hints and practical, clinical information of a non-emergency nature.Nursing Alerts throughout the text provide you with critical information that must be considered in providing care.UNIQUE! Emergency Treatment boxes serve as a quick reference in critical situations.Nursing Care Guidelines boxes provide you with clear, step-by-step, detailed instructions for performing specific skills or procedures.NEW! Updated content throughout, notably methods of measuring competency and outcomes (QSEN and others), ambiguous genitalia, pediatric measurements, guidelines, and standards as defined by the American Academy of Pediatrics, and clear definitions of adolescent and young adult, keeps you up-to-date on important topic areas.NEW! The Child with Cancer chapter includes all systems cancers for ease of access.NEW and UPDATED! Case Studies now linked to Nursing Care Plans to personalize interventions, while also providing questions to promote critical thinking.